Currently available in Delhi NCR, Mumbai and Bangalore, Ola Lux has a fleet of high-end luxury cars including Toyota Camry, Mercedes, BMW and Audi. Riders of Ola Lux get connected automatically to complimentary WiFi, allowing seamless browsing on the go. The drivers too are among the best, who ensure a great ride experience every time, every ride. 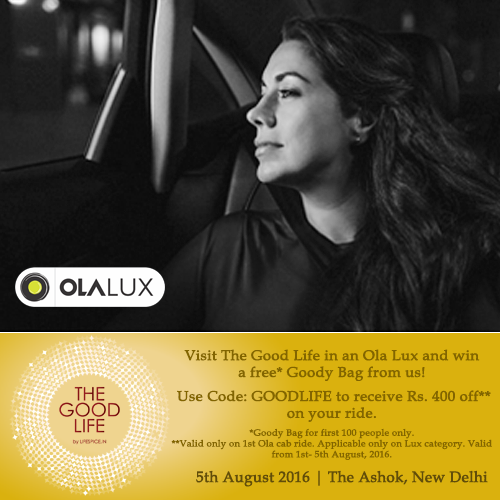 If you haven’t tried Ola Lux yet, then try it out on 5th August, 2016, to arrive at the venue of The Good Life by Lifespice.in. Use Code: GOODLIFE to get Rs. 400 off* on your bill. What’s more, the first 100 people to arrive in an Uber Lux will also be given a special Goody Bag with compliments of Ola Lux and LIFESPICE.in! *Valid only on 1st Ola cab ride. Applicable only on Lux category. Valid from 1st- 5th August, 2016.